+A solidly enjoyable strategy RPG with potentially hundreds of hours of gameplay to offer. - Not distinct enough from the original game to attract an audience outside of first-timers and die-hard Disgaea fans. Lord Valvatorez was once a mighty vampire and the tyrannical ruler of the Netherworld – but when he made a promise to stop drinking blood, he lost all his powers and fell to Hades, the Netherworld’s prison. Now Valvatorez spends his days as a lowly Prinny Instructor, but thanks to the schemes of his loyal advisor Fenrich and his obsession with keeping promises, Valvatorez finds himself once again on course to conquer the Netherworld. Just as Disgaea 1-3 did before it, the fourth main instalment in the Disgaea franchise makes the jump from console to handheld with this remake of Disgaea 4: A Promise Unforgotten for PS3. 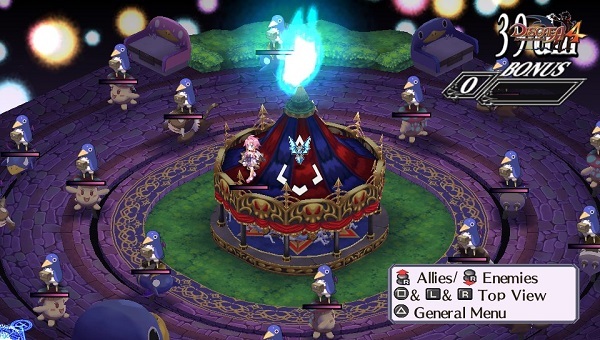 In this new version, some aspects of gameplay have been polished, a few ideas have been brought over from Disgaea 3 and D2, and all the DLC characters and maps have been included. If you’ve already played Disgaea 4 on the PS3, or indeed picked up any Disgaea game, you’ll already be very familiar with how this series plays. Each level takes place on an isometric grid, upon which you deploy your units with the aim of destroying the enemy. Naturally, since this is a Nippon Ichi game, there’s a vast array of gameplay mechanics at your disposal. You can recruit mages, melee attackers, ranged attackers and even monsters to create an unstoppable force of destruction – those with sufficient patience can even grind all the way up to Level 9999! The main quest is a solid ten chapters long, but there’s also plenty of bonus maps to unlock, plus a near-infinite selection of randomly generated dungeons for your levelling pleasure. 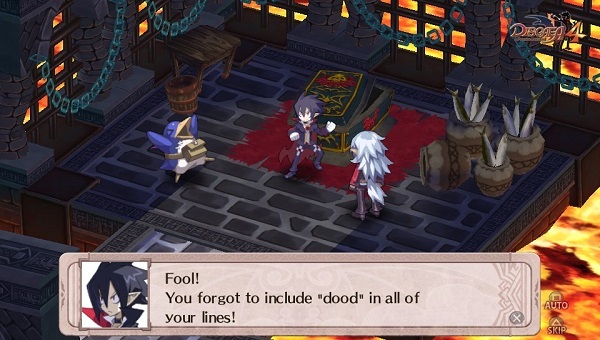 There are enough tutorials at the start to enable anyone to pick up enough of the game to be able to play, but to truly master everything that Disgaea 4 has to offer, you’ll have to be prepared to watch hundreds of hours of your life disappear into this vast time sink. Your quest to take over the Netherworld is cast as a political campaign (albeit a rather violent one), with your party members acting as senators who do double duty both fighting on the battlefield and forming your cabinet. Your Cam-Pain (see what they did there?) HQ forms your hub, and as well as sporting all the options from the PS3 version, there are some extras culled from the more recent Disgaea D2. Most of these are just tweaks to the interface that make gameplay a bit more intuitive, but they are welcome changes nonetheless. There’s still room for improvement, however – the game suffers from the common Nippon Ichi failing of not getting the learning curve quite right, leading to significant hikes in difficulty at certain points that necessitate breaks from the main story for hours of grinding. The game also suffers from slowdown on densely packed stages, such as those found in the random dungeons of the Item World. 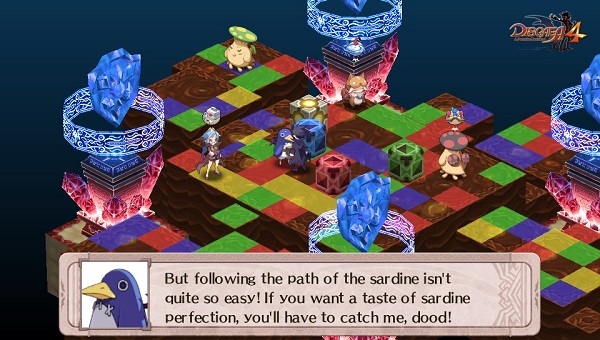 Nippon Ichi games are always a bit hit and miss with their storyline, but Disgaea 4 is actually one of their better efforts – especially coming as it does after the vapid plot of Disgaea 3. As usual, the characters are over the top, and a few of them are annoying, but as a group they’re generally likeable, whilst the main storyline is entertaining rather than idiotic. Disgaea 4′s Vita outing has been sharpened and smartened up in the graphics department, with new hi-res sprites adding to what was already a nice-looking visual experience. The background music hasn’t changed from the original, and offers the usual quirky range of tracks by Nippon Ichi stalwart Tenpei Sato. There’s no doubt that Disgaea 4 for Vita is a good game, but whilst there are a few extra bells and whistles, it isn’t significantly different from the original PS3 release. If you’re a strategy RPG fan who never got around to playing the original, it’s a nice little package, but other than that, only the most dedicated of Disgaea fans need invest in this.